What fearful power, what awesome divinity is repetition! It is the pull of the void that drags us deeper down the ever widening gullet of a whirlpool. Radical political theorist of socialism & barbarity. Hindu: FEAST OF GUARI, celebrated by married women with widows taking no part. Elsewhere in India, a DAY FOR THE WORSHIP OF TOOLS. 537 -- Goths lay siege to Rome. 1302 -- Romeo marries Juliet. About time. 1544 -- Torquato Tasso (1544-1595) lives. Greatest Italian poet of the late Renaissance, best remembered for his masterpiece Jerusalem Delivered (1575). 1726 -- Mme d'Épinay lives, Valenciennes. Friend of Diderot, Rousseau, Voltaire. Best known for Conversations of Emily & three volume Memoirs & Correspondence . 1744 -- England: Sotheby's, the London auctioneers, has it's roots in this day, as Samuel Baker begins a 10-night sale of "several Hundred scarce & valuable Books." His nephew, a Sotheby, takes over the business when they close the book on Baker. 1811 -- England: Luddites attack machines designed to replace them in the weaving of wool. As part of their strike, Luddites riot, protesting capitalism by smashing machines that dehumanise them — 63 frames broken up at Arnold near Nottingham. 1812 -- England: Luddites suffer first defeat at Rawkolds Mill, Great Britain. 1818 -- Mary Shelley publishes her Frankenstein novel. The story of Frankenstein started the summer of 1816 when she joined with Percy Shelley & Claire Clairmont near Geneva Lord Byron. She took a challenge set by Byron & Shelley to write the most frightening ghost story. The idea came to her in a dream. The first edition of the book had an unsigned preface by Percy Shelley. Many thought it was his novel, not believing a 19-year-old woman could write such horror. Published in 1818, it became a huge success. 1833 -- Nicaragua: US troops "intervene." Protecting "US interests" rather than Nicaragua's we'd suppose. 1835 -- William Makepeace Thackeray, after reading Charlotte Brontë's Villette , is moved to comment: "The poor little woman of genius!...I can read a great deal of her life as I fancy in her book, & see that rather than have fame...she wants some Tomkins or other to...be in love with." 1845 -- New Zealand: Maori uprising against British rule. Today Ngapuhi attack & take Kororareka (now Russell) township, Bay of Islands. Approx 50 deaths altogether. British settlers flee to Auckland. The Maoris realized that the white settlers were increasing at a fast rate, & several violent Maori uprisings occurred between 1845 & 1848, & between 1860 & 1872. These uprisings are known as the New Zealand Wars. 1847 -- US: Johnny "Appleseed" Chapman dies. Known as Johnny Appleseed for his large number of fruit tree plantings. He is regarded as the "patron saint" of orchardists in the US, & this is celebrated as his day. 1850 -- Clément Duval lives (1850-1935). anarchiste illegalist, member of "La panthère des Batignolles," sentenced to death by a French court for a burglary (in which a policeman was wounded trying to apprehend him). Duval spent 14 years in prison in French Guyana Guyane; Guiana where he attempted over 20 escapes. Finally, in 1901, he made good his escape & eventually slipped into New York City, where he lived until age 85, supported & surrounded by Italian & French anarchist comrades. "Vous m'inculpez de vol, comme si un travailleur qui ne possède rien peut être un voleur. Non, le vol n'existe que dans l'exploitation de l'homme par l'homme, en un mot par ceux qui vivent aux dépens de la classe productrice." 1857 -- Spain: Spanish war poet Manuel José Quintana, dies in Madrid. Wrote classical odes marked by patriotism & liberalism, including the two-volume Vidas de españoles célebres ("Lives of Famous Spaniards"). 1858 -- India: During the Great Indian Indian Mutiny (also known as the Sepoy Rebellion, sepoys being the native soldiers), the battle of Lucknow rages, Mar. 9-16. The Brits win, & in June, victory at Gwalior effectively ends the Mutiny. Harsh reprisals against mutineers follow. Sir Harry Flashman, of course, was there; disguised as an Indian cavalryman he was caught up on the wrong side of the Indian Mutiny! 1876 -- Dutch council communist theorist David Wijnkoop lives, Amsterdam. 1888 -- US: "Blizzard of `88," ushered in by an official New York Weather Bureau forecast of "clearing & colder preceded by light snow," killed 200 in New York state & nearly 600 in surrounding states. 21 inches of snow dumped on NY, 70 mph gusts piled up 20 foot drifts, marooning New Yorkers in elevated trains, carriages & office buildings. The storm stalled for a day & a half. In Connecticut & central Massachusetts, 40-50 inches of snow fell. Winds piled up 40 to 50 foot drifts. Houses & trains were buried. From Chesapeake Bay to Nantucket, 200 ships were sunk or severely damaged. "I started out to school & had with me a clothes-line about 25 feet long, with the end tied to our doorbell in the event I could not cross the huge snow drifts to gain the center of the road on Tremont Ave."
1892 -- France: François Ravachol takes retribution for the Clichy defendants, bombing the homes of the presiding judge (March 11, 1892) & the prosecutor (March 27, 1892). Police in Clichy had attacked a six-man anarchist labor rally. The workers defended themselves with guns & ended up behind bars with long terms of hard labor. 1907 -- Bulgarian Premier Nicolas Petkov is slain by an anarchist. 1909 -- Maurice Laisant lives. French author, anarchiste, antimilitarist. Albert Camus & other libertarians came to his aid when the state brought charges against him for his activities. Son of the anarchist Charles Laisant & brother of the anarchist Albert, grandson of the anarchist Charles Ange Laisant. 1910 -- US: Emma Goldman speaks on "The General Strike [of Philadelphia]" in Pittsburgh. The "free" press will not announce her talks in fear that she will prompt a riot. 1911 -- Alba de Céspedes lives. Italian author/poet & pioneering feminist, best known for her diary novel Quaderno proibito (1952). A journalist in the 1930s, imprisoned twice by the Mussolini regime. In 1944 Céspedes founded literary magazine Mercurio , publishing works from modern Italian writers, including Alberto Moravia, Eugenio Montale & Elio Vittorini. 1914 -- Novelist Ralph Waldo Ellison lives, Oklahoma City, Oklahoma. Invisible guy, with a fetish for light bulbs in his once dark basement. Black American novelist of under-class, under-race. 1915 -- US: Emma Goldman disappointed by the poor attendance at the tenth anniversary of her magazine Mother Earth in New York. 1917 -- "Our armies do not come into your cities & lands as conquerors or enemies, but as liberators." Britannia ruled brutally. Arthur "Bomber" Harris (who was to lead the bomber offensive against Germany in World War II) did not try to hide the fact that he had aimed at civilian targets. Harris admitted in 1924 that he had taught Iraqis "that within 45 minutes a full-sized village can be practically wiped out & a third of its inhabitants killed or wounded." Winston Churchill, as British colonial secretary, agreed that aerial explosives were indeed a good idea. But wouldn't aerial gassing be even better? As he put it, "I do not understand this squeamishness about the use of gas. I am strongly in favor of using poison gas against uncivilized tribes." "It is odd that we do not use poison gas on these occasions." Mollie Steimer, free on appeal for her 15-year sentence for handing out leaflets, is arrested at the Russian People's House on the East 15th Street during a raid by US federal & local police which netted 164 radicals. Charged with inciting to riot, Mollie was held for eight days in the notorious Tombs prison before being released on $1000 bail, only to be arrested again & taken to Ellis Island for deportation. Locked up for 20 hours a day in the Land of Freedom, denied exercise & fresh air & the right to mingle with other political prisoners, she went on a hunger strike until authorities met her demands. "The entire machinery of the United States government was being employed to crush this slip of a girl weighing no less than eighty pounds," Emma Goldman complained. Among Emma's closest comrades were Mollie Steimer & Senya Fléchine, who also left Soviet Russia after conditions there became intolerable for anarchists. On Mollie Steimer, see Marsh, Anarchist Women, Avrich, Anarchist Portraits; Polenberg, Fighting Faiths; & the pamphlet, Sentenced to Twenty Years Prison (New York: Political Prisoners Defense & Relief Committee, 1919). See also the memorial volume edited by Abe Bluestein, Fighters for Anarchism: Mollie Steimer & Senya Fleshin ([New York]: Libertarian Publications Group, 1983). 1920 -- Poet, novelist, editor of The Oxford Book of Contemporary Verse 1945-1980 , D.J. Enright lives, Leamington, Warwickshire, England. "We sent out a call to all the workers of Russia to fight for freely elected Soviets. Our cry was heard. Already, the revolutionary sailors, workers & soldiers of Petrograd are coming to lend us a strong hand." 1922 -- Turkey: Cornelius Castoriadis lives (1922-1997), Istanbul. Aka Pierre Chaulieu or Paul Cardan. Radical polotical philosopher, social critic & editor of the Journal Socialism or Barbarism (1949-1967). 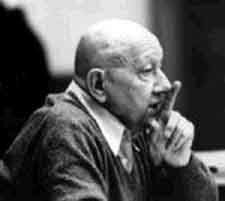 Castoriadis was an activist in the extreme left of the Trotskyist movement before moving to France, where he formed the Socialism or Barbarism group in 1948 with Lefort & Lyotard. 1926 -- England: George Lansbury proposes in Parliament abolition of Royal Navy. 1930 -- India: Gandhi's Salt March begins, from Ahmadabad to Delhi, in protest against salt tax. 1931 -- Rupert Murdoch, Australian rightwing media magnate & Sun God, lives. Think you have an original idea? Sorry, Rupert already owns most of those. 1932 -- Poland: The second leg of Emma Goldman's tour begins with two successful meetings (March 11-12) in Breslau (now Wroclaw, Poland) — a lecture to FAUD (Freie Arbeiter-Union Deutschlands) members on the American labor movement & a public meeting of the Gilde freiheitlicher Bücherfreunde. 1935 -- US: Shark Bait? The trial of prolific child murderer & incorrigible sexual deviate Albert Fish begins. Charged for murdering & eating 10-yr. old Grace Budd; he ends convicted & executed, White Plains, New York. 1937 -- Spain: Ideas calls for the dismissal of Aiguadé. 1937 -- Macbeth Mine explodes — again — this time killing 18 workers at the Hutchinson Coal Company mine in Logan County, West Virginia. — Tom Breiding, "The Obituary of Joe Fry," a song written after discovering the death notice of a miner who died in the Macbeth Mine explosion of 1937. As a March rain fell, scenes from September past were being replayed. Ten men were killed then. Some of the men who helped carry out bodies in the first explosion were now mangled corpses in the same entries they had trudged over bearing stretchers. 1937 -- Gudell notifies Emma Goldman (in England) of the establishment of a new committee composed of members from the C.N.T. [Confederacion Nacional del Trabajo] & the FAI to handle all foreign propaganda matters, in order to alleviate inefficiency caused by the personal & political rivalry between Augustin Souchy & Helmut Rudiger (aka M. Dashar) over propaganda. 1944 -- US: Edgar Zilsel dies, a suicide in Oakland, California. Born in Austria in 1891, a mathematician, physicist & philosopher, Edgar was an historian & sociologist of science ( The Social Origins of Modern Science ), a member of the Vienna Circle & a teacher at Vienna People’s University. His wife, Ella, taught English & German literature. At the onset of the Nazi occupation in 1938, they fled to England & ultimately obtained refugee status in the US, although other family members perished in the Holocaust. His son, Paul Zilsel, was a physicist & long-time Seattle anarchist & founder of Left Bank Books. 1950 -- Cuba: Third National Libertarian Congress (March 11-22) "to reorganize the libertarian labor movement & adopt concrete practical measures, enabling its militants to reorient themselves & to play a decisive part in the regeneration of the Cuban labor movement." 1950 -- US: Flying Subs? American Airlines TWU maintenance workers win 11-day nationwide strike, gaining first severance pay clause in industry & limits on subcontracting. 1952 -- Douglas Adams, English author, lives in a Restaurant at the End of the Universe. Patron of Dian Fossey Gorilla Fund & Save the Rhino International Died, aged 49, in March 2001. Don't Panic! 1953 -- US: Nice Catch? : An American B-47 accidentally drops a nuclear bomb on South Carolina, the bomb doesn't go off due to six safety catches. 1954 -- US: Army charges Beloved & Respected Comrade Leader Senator Tail Gunner Joseph McCarthy & his counsel, Roy Cohn, with using threats in trying to get preferred treatment for Private G. David Schine. Robert Kennedy has left McCarthy's staff by this time. McCarthy & Cohn's witch hunting days are about to end. 1958 -- USA: H-Bomb falls on Mars Bluff, South Carolina; the nuclear device does not detonate, but does leave a crater 35 feet deep. Didn't they just do this a couple years ago? 1959 -- "Raisin in the Sun," by Lorraine Hansberry, the first Broadway play by a black woman, opens. Superb American playright of great social conscience. 1963 -- André Lorulot (1885-1963) dies. French anarchiste, lecturer & propagandist. Andre Lorulot, a leading French individualist before WWI & a leading freethinker for half a century. 1965 -- US: Nearly 100 civil-rights activists picket the White House, demanding support for equal rights in Alabama. The protest culminates as a dozen picketers march into the presidential mansion & begin a sit-in. After six hours, police arrest the demonstrators. Today's sit-in is one of several massive protests across the country against police & mob actions in Selma, Alabama. Just this year in the city, more than a thousand protesters have gone to jail, state cops have beaten to death an African American youth, white hoodlums have killed a Boston minister, the Ku Klux Klan (KKK) has murdered a Detroit housewife, & state trooper attacks have sent over 50 peaceful marchers to the hospital. Get this? Time magazine sez there's an acid epidemic. SF Examiner front page: bust of 25 "beatniks" from 408 Ashbury. President of GM apologizes to Senate subcommittee for investigating Nader's private life + car safety protests. Should have apologized to Nader. 1968 -- "Sittin' on the Dock of the Bay" earns soul legend Otis Redding his only gold record — three months after his death. 1968 -- Poland : Polish students attacked by Communist police in Warsaw. From 8-9 March Warsaw has seen student agitations & protests; today they are joined by workers uprising, as factory workers battle police & militia in downtown Warsaw. Some 4,000 students marched through Warsaw yelling: "Down with the dictatorship." They were demonstrating peacefully, but were attacked & badly beaten by police; workers were agitated by communists to beat "decadent students." 1968 -- West Germany: Rudi Dutschke (1940-1979) — a leader of the German Socialist Student League (SDS), who had played an important role in the militant anti-war protests in the winter of 1967-68 — is shot & nearly killed by a Munich house painter carrying with him a clipping about the assassination of Martin Luther King, Jr. In the wake of this shooting, students carrying red banners & portraits of Rosa Luxemburg & Karl Liebknecht, the murdered leaders of the German communist uprising of 1919, clashed with police as they assaulted West Berlin's City Hall & the fashionable Kurfurstendamm. Similar events shook a dozen other West German cities. 1968 -- ¶ During this month Beatster Jack Kerouac travels to Europe with Tony & Nick Sampas, visiting visits Lisbon, Madrid, Geneva, Munich, Stuttgart. 1971 -- Puerto Rico: Uprising at the University of Puerto Rico. 1972 -- Run-on Sentence? : A sentence of 384, 912 years is demanded against postman Gabriel Grandos for failing to deliver 42,768 letters. 1973 -- US: FBI agent fatally shot at occupation of Wounded Knee by Oglala Sioux where the formation of independent Oglala Sioux Nation is proclaimed at Wounded Knee, South Dakota. "That women & children were casualties was unfortunate but unavoidable, & most must have been [killed] from Indian bullets...The Indians at Wounded Knee brought their own destruction as surely as any people ever did. Their attack on the troops was as treacherous as any in the history of Indian warfare, & that they were under a strange religious hallucination is only an explanation not an excuse." 1976 -- US: Cesar Chavez ends 23-day fast for farm workers. 1979 -- Ireland: In anti-tax demonstrations 50,000 people march through Dublin, most of calling for a General Strike. An estimated 150,000 or more people march through Dublin on 20 March & other protests occur in 30 towns throughout the country, including a march by 40,000 workers in Cork. Furthermore, by breaking-up the Soviet Union, dismantling the Soviet military & pursuing nuclear disarmament & world peace, Moscow has instilled a false sense of security in the West that is opening the way for Russia to successfully launch a surprise third world war against the West. All in all, through Mikhail Gorbachev's lies, the way is opened for a global war of mass destruction after which Russia can enslave the world... Of course, the leader of the New World Order that will be established after the radioactive dust settles will be the person who deceptively brought about the global chaos & insanity in the first place: Mikhail Gorbachev." 1986 -- 1 million days since traditional foundation of Rome, 4/21/753 BC. 1986 -- Spain: During fights with the cops, steelworkers in Reinosa surround the Guardia Civil, beat them up, strip them naked, & march them out of town. 1988 -- US: Beginning of 10 days of direct actions at Nevada Test Site which result in over 2,200 arrests, the largest number of arrests at a political protest outside Washington, DC in US history. The event is almost completely ignored by mainstream media. 1990 -- Chile: General Augusto Pinochet gives up power after 16 years of American government & corporate-supported terror. The democratically elected President Salvador Allende was overthrown in a military coup orchestrated by the CIA. The country was shattered by the American government & a team of right-wing economists from the University of Chicago (Nobelist Milton J Friedman & Co.), who turned it into an experimental hothouse. Surprisingly, the poor got poorer & the incomes of the rich skyrocketed. 2001 -- México: Over 100,000 greet Zapatistas at the conclusion of their 15-day trek to México City in demand for indigenous rights. "It is time for this country to stop being an object of shame dressed in the color of money." March 1999: I think Jo M. wants to unload a lot of books which Recollection Books could use — this is a reminder to call her. Sometime later: Remember my (57th) birthday is on March 11th. I'm not wasting my breath blowing out the candles — I'm just holding the cake out the door. I can send you even more titles if you'd like [editors note: her want list groweth] — I purposefully didn't list anything about death, cancer, or the afterlife the first time around. How's your mother these days? Tell her & Dan I send my love. Happy Valentine's Day from your old girlfriend, Ruth. PS: Are you still living with Sue, the mother of your child, for whom you so shamelessly abandoned me those many years ago? I love birthdays. I especially like the whooshing sound they make as they go flying by. WASHINGTON (CNN) --The cafeteria menus in the three House office buildings changed the name of "french fries" to "freedom fries," in a culinary rebuke of France stemming from anger over the country's refusal to support the US position on Iraq. The name changes were spearheaded by two Republican lawmakers who were bored stiff trying to find something worthy to do. The jingoistic practice of changing the language to ride with current political tides was most prevalent in World War I, when sauerkraut temporarily became liberty cabbage or pickled vegetables, hamburger was referred to as Salisbury steak, Germania Life Insurance became Guardian Life & dachshunds were called liberty pups. (Frankfurters had earlier become known as hot dogs. About the only common phrase Germany left largely intact was German measles.) The English language is resilient...eventually members of the House will go back to gorging themselves on French fries. If chauvinistic warmongers want to start renaming stuff, it should be Iraqi stuff. There's probably not much point in going after Iraqi food such as masgoof (barbecued fish) & pacha (sort of an Iraqi haggis) because Americans don't eat them. A better idea would be to tear out every page in the Bible that features an Iraqi place name, such as Babylon, Babel, the Garden of Eden, Nineveh, & Ur. The Christian right will object, but we all have to make sacrifices during wartime. 2004 -- Spain: Religious fanatics blow up crowded railway station in Madrid, killing 191 people & injuring over 1,500 others. This is ostensibly for the Spanish government's involvement in the US recolonization war Iraq. 2005 -- Spain: On the one-year anniversary of the Madrid bombing, religious clerics issue a fatwa against Osama bin Laden, head of the al-Qaida movement responsible for the terrorist explosion. The Islamic Commission of Spain, representing the country's 1 million-member Muslim community, calls him an apostate & urges Muslims to denounce him. 2011 -- Fukushima Daiichi nuclear disaster, in a series of equipment failures, nuclear meltdowns, & releases of radioactive materials at the Fukushima I Nuclear Power Plant, following the Tohoku earthquake & tsunami. An intelligent man cannot become anything seriously, & it is only the fool who becomes anything.